Only 30 lbs. left in stock! 100% Authentic blend of coffee from Yemen Mocca and Indonesian Java! This is a 100% Authentic blend of Yemen Mocca and Indonesian Java coffees. Round, full body, with earth tones, rich, smooth, and complex. 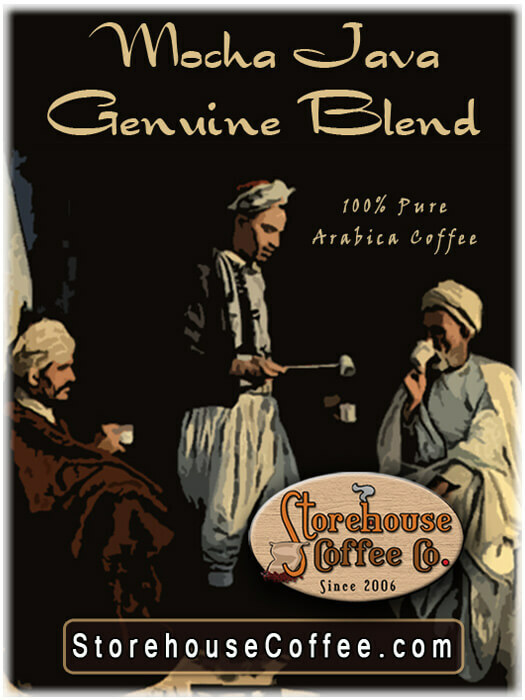 If you have never tried an authentic blend of Yemen and Java, then you are in for a real treat! Combining the full body and rich mouth-feel of Indonesian Java with the complexity and wildness of Yemen Mocca creates an unforgettable blend with layers of complexity at any roast level. Earthy and deep-toned with aromatic wood notes that give way to dark chocolate, spice, and red fruit. Rich, bold, captivating, and complex. Our favorite roast level is Full City (to keep the origin characteristics maximized), but a Full City (+) came in a close second. If you are looking for wildness, fruit and complexity, then look no further. City roast will highlight the potency of the Yemen with it's fruity tones, yet still providing the depth and body from the Java. A very rustic choice. This is our preferred roast level. Nice chocolate tones combine with wonderful Indonesian spiciness, earthiness, and perhaps some nuttiness. The acidity is balanced yet still allows for the pointedness of the Yemen to shine! This is the roast that will yield a more syrupy mouth-feel, deeper body, dark chocolate, deeper red fruits and a sharper lingering finish. This roast has that solid dark roast quality, yet remains very smooth. Almost no acidity or fruit tones remain, but the body is big with earth and dark chocolates. The finish is long and sharp. This roast is pushing the value point as it will nearly eclipse the characteristics of the Yemen. However, this would be a good choice for an after dinner coffee or dessert coffee because of the bittersweet chocolate tones syrupy smoothness and sharp lingering finish. Not to repeat ourselves too much, but this is an authentic blend of Yemen and Java. Don't settle for less than authentic. Mocha Java is my favorite blend. It has a lot of body and tastes chocolaty. I usually like my coffee at a darker roast but I would not go darker than Full City on this one. Reviewed by: Caitlin Wang from California.